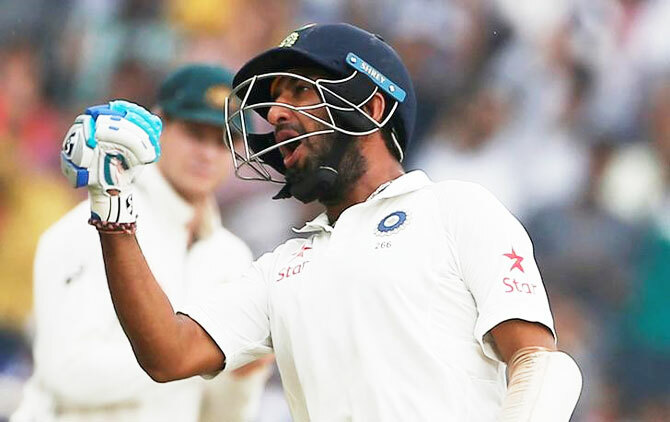 Cheteshwar Pujara compiled an epic double century and Wriddhiman Saha complimented with a career-best 117 to deflate Australia and put India in a strong position. Test double-hundreds for Cheteshwar Pujara – only five Indians have scored more double tons than him – Virendra Sehwag, Sachin Tendulkar (6 each), Rahul Dravid (5), Sunil Gavaskar and Virat Kohli (4 each). Number of balls faced by Pujara, the most by an Indian in a Test innings. Rahul Dravid set the record in 2004 when he faced 495 balls in his 270 against Pakistan in Rawalpindi, 2004. Navjot Singh Sidhu – 673 minutes for his 201 vs West Indies at Port-of-Spain in 1996-97. The number of Test hundreds made by Wriddhiman Saha. Now only Mahendra Singh Dhoni (6) has made more hundreds than him as a wicketkeeper for India. Saha went ahead of Budhi Kunderan, Farokh Engineer and Syed Kirmani, who each has scored two hundreds. The number of batsmen to have scored more than one double hundred against Australia. Pujara joined Wally Hammond (4), Brian Lara (3), Graeme Pollock, Sachin Tendulkar and VVS Laxman (2). Runs scored by Saha – highest score by a number 8 batsman in India – Australia Tests. MS Dhoni had made 92 at Mohali in 2008-09. The partnership between Pujara and Saha, the highest seventh-wicket partnership in Test cricket between the two sides. The previous best was 173 by Andrew Symonds and Brad Hogg at Sydney in 2007-08. The number of times India have posted a total of 600 or more against Australia. Only England have done so more often – 7 times. And England have played 341 Tests against Australia as against India’s 93. The number of overs bowled by Stephen O’Keefe, the second most any bowler has ever bowled in a single innings in India after Pakistan’s Haseeb Ahsan’s 84 at Chennai in 1960-61. These are also the most by an Australian since Jim Higgs, who bowled 79.4 overs against England at Sydney in 1978-79. The number of overs bowled by Australia, the most since 1975, when they bowled 233.5 overs against England at The Oval. India’s total – their highest at any Indian ground hosting its first Test match.